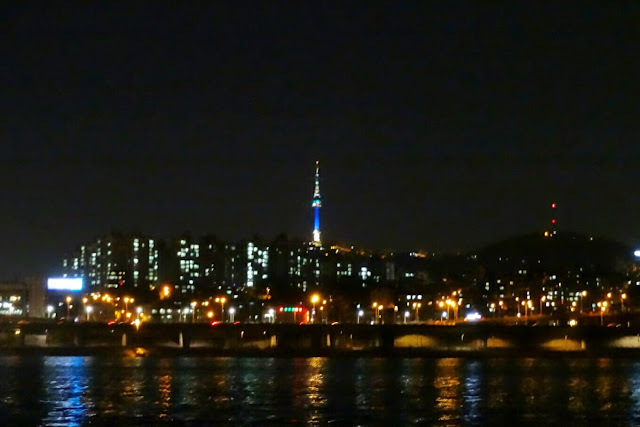 The difference between China and South Korea was evident from just driving into Seoul from the airport. The buildings looked more western in design, the streets were wider and more spacious and American restaurants and cafes could be seen everywhere. 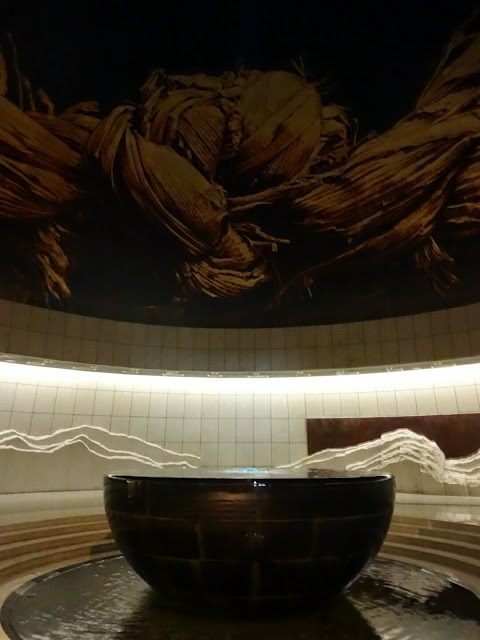 After we arrived at the worlds smallest hostel room, we decided not to waste a moment and visit Seoul's number one attraction - The War Memorial Museum. 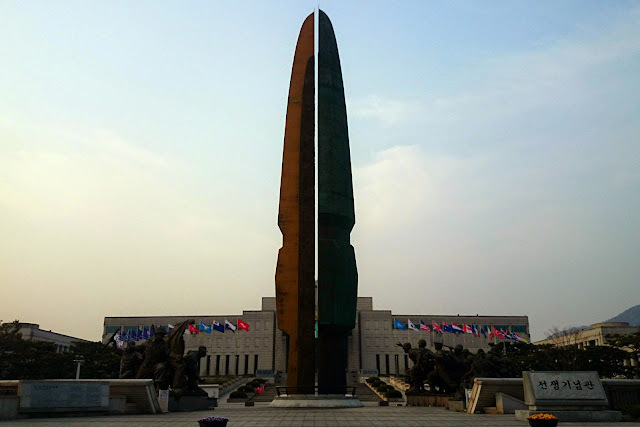 Knowing relatively little about the Korean war and knowing that we would be visiting the JSA (Joint Security Area) and DMZ (Demilitarised Zone), we knew we needed to learn more. The building itself was very American with white bricks and a big open entrance. The inside, however, was spectacular. We were given a tour map that directed us the correct way around the museum and explained the significance of many of the tribute rooms. The whole museum was hugely respectful and grateful to every solider who lost their life during the war, from every nationality. The displays helped us form a picture of what happened over 60 years ago and what affect it still has today. Outside the museum were military vehicles used in the war - even some of the less intimidating ones were still capable of mass evil. 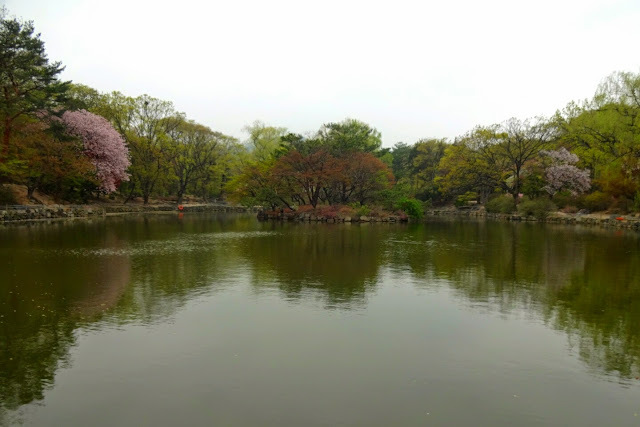 The next day was palace day - Seoul still has 5 well preserved/rebuilt Palaces from the Joseon Dynasty. 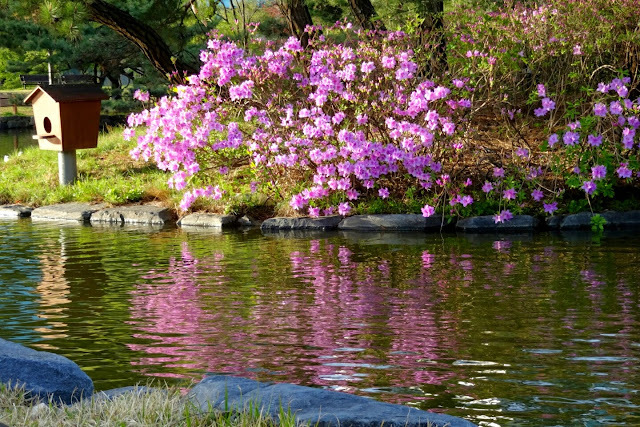 The first palace we visited was the newest - Changgyeonggung. This palace was built when the original palace became too crowded. Construction of this palace began in 1483. When we arrived at the palace, we joined an English tour around the main complex. This was very informative and the woman seemed to know facts about everything from the Joseon Dynasty symbolic features to the Japanese occupation. The palace was heavily altered by the Japanese and restoration work to return the palace to its original state began in 1983. The design of the buildings were very similar to many of the Chinese buildings, but the paintwork was more green. The interior of the buildings, however, seemed influenced by the Japanese with sliding partition doors and the need to remove shoes before entering. 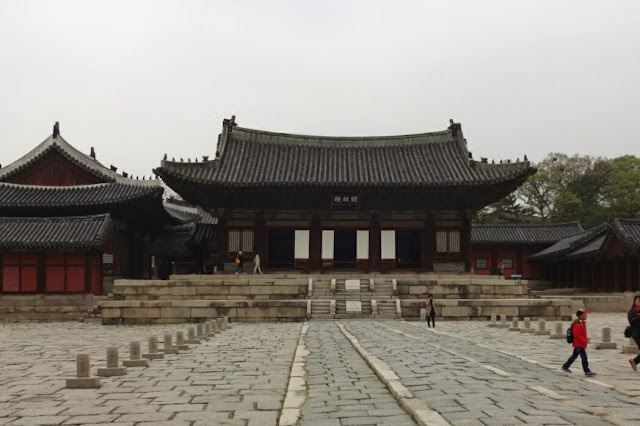 The next palace we saw was Chandeokgung - the previous palaces older brother. The palace was significantly larger than the previous. It's bridge (that separated the royals from the commoners) was also larger and much older. The palace itself had more king paths (a raised central section on the entrance path for use of the king) and more residential sections. Towards the back of the complex was a very oriental style building from the last king who had no children, but did have several concubines. For our lunch break we had our first taste of Korean food - bibimbap, a supposed vegetarian meal. When the food was brought to us we had purple rice, cold carrots, lettuce, mushrooms, cabbage and curry paste (yuck!). In addition we had several bowls of additional food including fish broth, silver fish with eyes and octopus. Neither of us enjoyed the food and don't think this was the correct choice of Korean food for us! An American man who had clearly spent a lot of time here suggested we stick to noodles if we want to eat vegetarian! 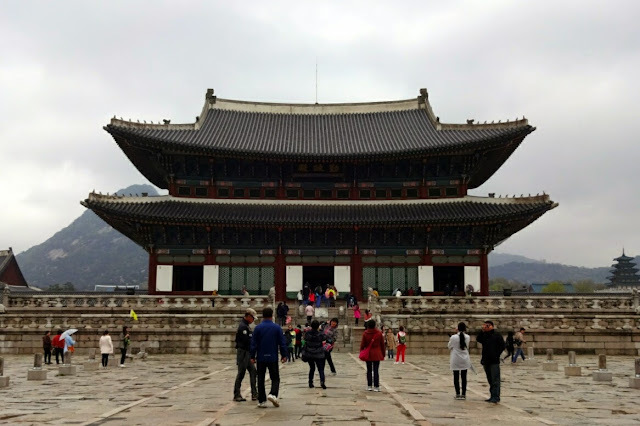 Our final palace was Gyeongbokgung Palace, which was founded in 1395. 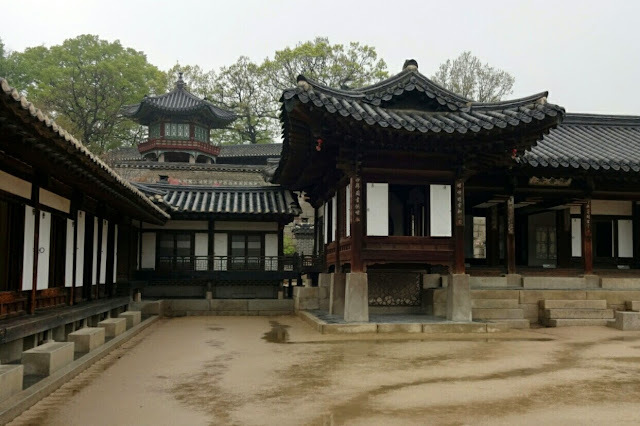 This was the Joseon Dynasty's main palace: center of power, politics, economy and culture. Unfortunately the entire palace was torn down during the Japanese occupation of 1911-1945, so all the buildings are restorations of what the palace would have looked like. We joined another tour at this palace, unfortunately much of the information was repeated, but the tour did emphasis the true purpose of each of the buildings encountered. In the evening we spent much of our time in the Bukchon district. This area is famous for its traditional Korean buildings and narrow alleys. Just outside the region was what can only be described as pizza street! After such a scary lunch we enjoyed our second pizza of South Korea. The area was filled with lots of little cafes and trinket shops and lacked the tourist factor of many other palaces. The next morning was an early start for our JSA/DMZ tour. 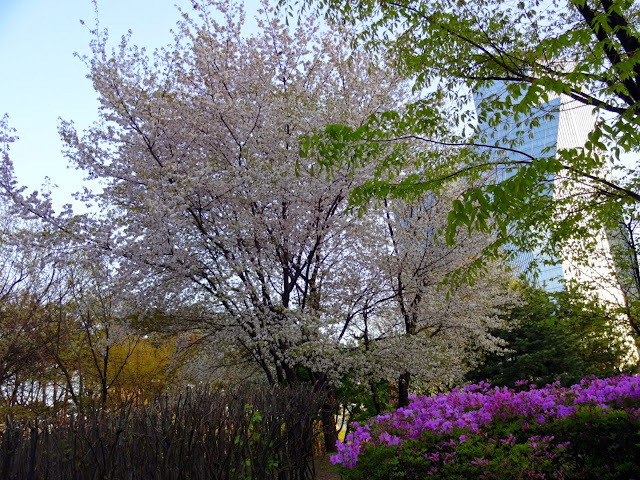 When we returned we headed for Yeouido park. On our journey there we were reminded of how South Korea is still at war. The station was called a Shelter - a place where people needed to go to in case of attack. Whilst in the station there were emergency escape routes and plans on every level. There were also smoke masks and oxygen tanks in huge cabinets on every level. Although it feels completely safe there, there are constant reminders that North Korea could break the Armistice agreement at any time. 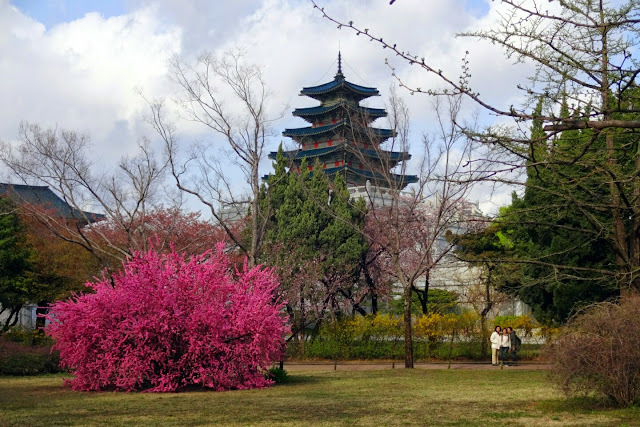 When we arrived at the park we went in search of Cherry Blossom Trees. Sadly, we only found Cherry Blossom petals on the park floor. Regardless, the park was very pretty and was a beautiful contrast from the skyscrapers that surrounded it. 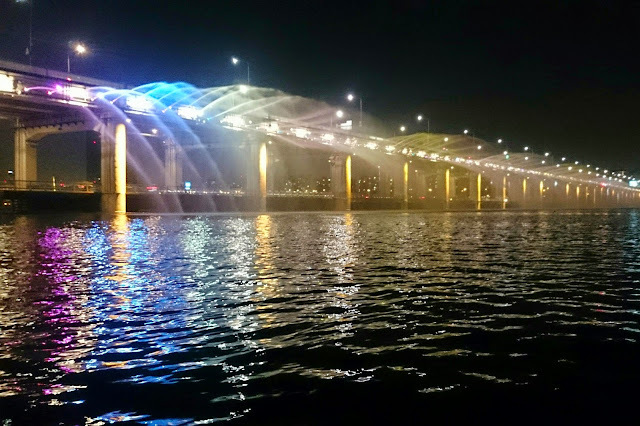 Finally we headed towards the Rainbow Light Show on Banpo Bridge. It consisted of spurts of water being ejected from the bridge whilst being illuminated by shades of purple, blue and yellow. The show was okay, but the river did provide amazing views of the city at night! Overall, Seoul is an amazing place. Quite westernised whilst maintaining its oriental charm. The people are happy and helpful and the government seem to invest a lot into the community - providing many outdoor gyms and sport facilities. It's filled with lovely parks and huge skyscrapers creating a wonderful contrast of old and new.